My heart always sinks when a friend comes back from a Kauai vacation and tell me they had a miserable time because it rained “the whole time.” I also think back on my first visit to Kauai when it rained a couple of days and we stayed in our room and sulked. 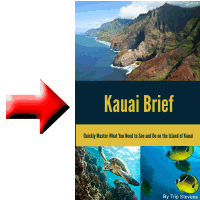 But gone are those days and that attitude as I have figured out what to do on Kauai when it rains–just like many other seasoned travelers. Here is a quick list that is by no means exhaustive. Wait it Out. Yep, even if it rains every day, it may not rain all day. Bring up the weather forecast by the hour and you may find that the rains will be passing on soon. You may need to shift your plans slightly and eat or call home during the rainy time so you can get out on your adventure as soon as it passes. Head South or Maybe West. If you are up in Princeville, head down to Poipu. If you are in Poipu and it is raining, head a little west over to Waimea. Or if you are in Waimea, go even further west over to Polihale beach. Check weather conditions because if you are on Kauai and it is raining, there is a good chance that there is somewhere on the island that it is not. People or Ocean Watch. Sometimes it is fun to sit on your Lanai and watch the people shuffle by. I have also been amazed at how the wildlife can often become a little more active when it rains. On more than one occasion, my family has watched seals swim up onto the beach during the rain. Ignore the Rain. I don’t live in Seattle but my employer has headquarters in the North West and most of my co-workers live there. It rains there alot and all my buddies have adopted the attitude that if they have planned an activity, they do it, whether it rains or not. You can adopt that same attitude. I have found it quite pleasant to snorkel in the rain. I am already wet and there aren’t too many people out in the water with me. Some folks have said that the rain stirs up dirt and obscures the water which brings in the sharks (which may be why the seals are exiting). I haven’t worried too much about that as I’m usually in some shallow reef but if that bothers you, hit the pool. You might find that you are the only one there. Again, you are already wet. Go for a Walk. Unless it is an outright downpour, walking in the rain can be quite pleasant. The temperatures are usually high enough to keep you warm if you have your rain jacket on. You might even have your umbrella. Strolls along the beach can be quite nice during these times. Shop. If you can’t stand the thoughts of getting wet, then head indoors when the rains roll in. There are plenty of places on the island that will accept your money during inclement weather. If you are up North, visit Ching Young Village (5190 Kuhio Highway). If on the East side, go see the Coconut Marketplace (484 Kuhio Highway). If in Lihue, go to Kukui Grove ( 2600 Kaumualii Highway). If in Poipu, you can visit the Poipu Shopping Village (2360 Kiahuna Plantation Drive). If you are over near Waimea, you can visit all kinds of shops along Kaumualii Highway. Be sure and get some shave ice at JoJo’s. If you are a book lover, visit the Talk Story Book Store, billed as the western most book store in the U.S. It sells new and used books and is well worth a visit if for nothing other than its charm. It is at 3785 Hanapepe Road in Hanapepe. Visit Many of the Covered Attractions. There are too many museums, historical sites, and art galleries to list here but you can google whatever interests you. If you need a starting list, consider the West Kauai Technology and Visitors’ center, Old Koloa Town Historical Center, or the Kauai Museum. If you need something more active, you can go bowling in Lihue at the Lihue bowling center (4303 Rice Street Lihue). If you are looking for something more sedentary, take in a movie at the Kukui Grove Cinema (4368 Kukui Grove St. in Lihue). Take Pictures. If you are a shutterbug, you already know that better pictures can be taken during cloudy and rainy conditions due to more diffuse lighting. The greens are greener and the colors more rich. Try visiting one of the many tropical gardens. See the National Tropical Botanical Gardens site for suggestions. Be sure and keep your equipment protected. Take a Class. Most hotels offer classes during the day with such diverse offerings as lei making, ukulele playing, and hula dancing. I have done it all but the hula dancing. Check in with your concierge to learn your options. Visit a Spa. Not only is Hawaii the most relaxing place on earth but some of the spas there are found in the most awesome surroundings. If this interests you, do a search on tripadvisor.com for Kauai spas. There may be one located in the hotel where you are staying. Relax. Yep, you have my permission to let your hair down a little bit. You are on vacation after all. Don’t get too uptight because of a little rain. Take a nap. Read a book. Listen to some Iz (Israel Kamakawiwoʻole). That alone will wash away all your cares. If fact, you should listen to Iz whether it is raining or not. 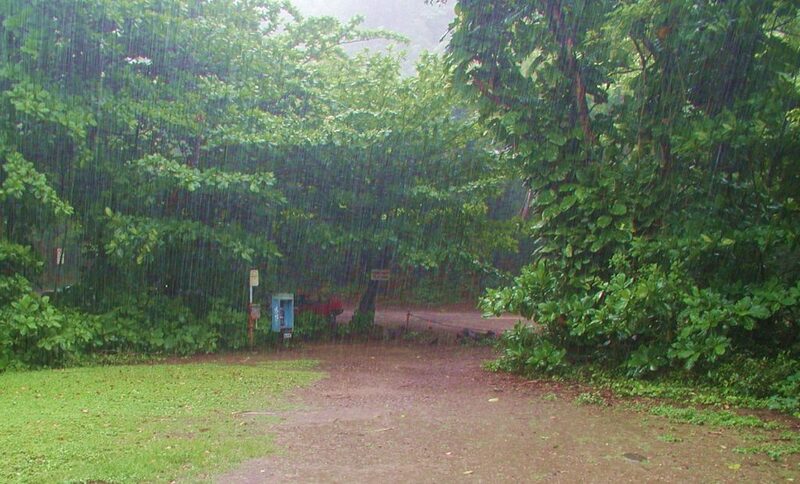 The truth is Kauai is the wettest of the Hawaiian island. The reason why the island is so amazingly lush and green is due to the rain. If you can’t handle a little rain, you shouldn’t visit Kauai. And please don’t ever complain to the locals about the weather. They are already aware of it. They live it. And they may not view you as a gracious guest. If you don’t like rain, go to Las Vegas instead. If you are still planning to visit Kauai, good for you. You will go and being informed, you will have a great time.